The signal station on the Vegesack riverbank of the Weser is a relic from last century’s shipping: Before communication took place by radio transmission or radar signage, captains on their way received valuable information about water levels, obstructions on the river and storm warnings by the signal station. The signal station had been built in 1888 at the harbour head, where today administrative buildings of the Lürssen shipyard are placed. Its three masts displayed water levels for the passing ships. The first mast served as a signpost where spheres and cones were hoisted. Each sphere denoted a water level of one metre over sea level, each cone tipping upwards 20 centimetres and each cone tipping downwards 10 centimetres. 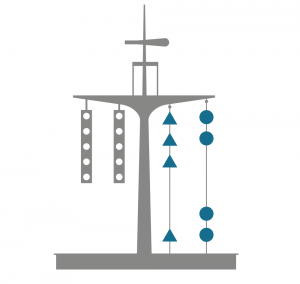 During nighttime, the information could be read from different lights on the second mast. The third one imparted obstructions, impediments and bad weather warnings. The signal station had been relocated to the Weserpromenade (embankment) in the 1950s, due to the enlargement of the harbour. Soon after this, a modern and storm surge-safe building was erected. From 1978 on, communication with the ships was changing in a fundamental way. The captains were conveyes all level data by radio communication, so that balls and cones became obsolete. When a modern radar signage system took over the task of directing the ships, the official activity of the signal station ended. The signal station -a Federal property -should be taken down in the early 1990s. The MTV Nautilus society fought for its preservation. In 1995, the station was handed over to the MTV. The society consists of a working group of members who maintain the signal station. Since then, it is a focus for maritime festivities and also staffed at weekends to provide information to visitors and to promote Vegesack as a maritime location. The association was founded in 1930 als „Stadtgartenverein Vegesack“. The Bremen Bürgerpark and its citizen’s association served as a blueprint for the Stadtgarten (city garden) in Vegesack. 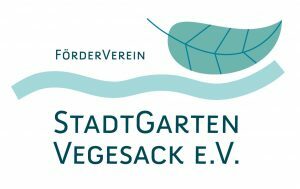 ‚The things done by the Bürgerparkverein on a larger scale should be achieved in Vegesack, on a smaller scale, by a Stadtgarten association. We therefore advocate the founding of a Stadtgarten association…‘ told an appeal by town major Wittgenstein from in the Norddeutsche Volkszeitung from 1929. The embankment of the Weser had been private property at this date: it was not accessible to the public. Dr. Wittgenstein pushed through a public road at the embankment. It was a strategical measure to open it up for the public. The Stadtgarten’s present-day dimension and design is due to the long and constant activity of this association. The water level station is also maintained by the Stadtgarten association, in a joint project with MTV Nautilus. The water level of the river Weser is continuously gauged. One of the seven measuring stations between the Bremen Weserwehr and Brake is the Vegesack water level. It is operated by the Wasser-and Schifffahrtsamt (Water and Shipping Authority) of Bremen. As early as 1855, the Vegesack water level had been equipped with a gauge staff. On this meter, the water level could be gained manually. Since this day, a gauge staff (or staff gauge) is an element of every water level station. They are either affixed horizontally at a wall or pillar or corresponding to the incline of the embankment (embankment gauge). As a rule, the yellow staffs with numbered black marks are set up within a distance of 10 centimetres. The crossbeams of the marks and their distance equal two centimetres each. In 1876, at Vegesack, a mechanic register gauge was put to work. The water level could now be recorded continuously. To this end, a so-called gauge shaft was connected by an incoming pipe with the river. 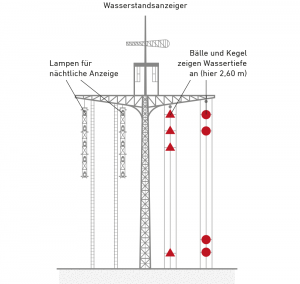 Thus the water level of the river Weser correlates with the water level in the gauge shaft. A floater was situated in the shaft, protected from wave motion and debris. A recording device in the water level station documented upwards and downwards movement of the floater. At first, the water levels were recorded in pen and ink, later on they used document-proof waxed paper. Since 1994, all data from the Vegesack water level station is digitally recorded and stored. The water level gets recorded once a minute, and an average calculated every 15 minutes. 96 figures per day will be retrieved and are available for up-to-date predictions as well as the collection of precipitation data. The water level is generally stated in centimetres and refers to a zero point of gauge. Thus, the water level is computed by the height of gauge zero plus the water level above this mark. The point zero does not refer to the depth of a body of water. In Germany’s coastal areas, a generic gauge zero of Normalhöhennull (standard elevation point zero) minus 5 metres is used. It denotes the altitude from sea level and was introduced as a successor of Normalnull (mean sea level) which elevations did not include the Earth’s gravitational field. The mittleres Hochwasser (mean high water) denotes the average of the highest water levels within a certain time. Often, high waters are put into relation to this figure. Water levels along the river Weser are often indicated at the signal station as relative to Normalnull (mean sea level). The relevant water gauge would be five metres higher. Negative figures would mean that the water level of the River Weser would lie, due to the tides, just below sea level. The four measuring stations at Große Weserbrücke, Vegesack, Brake and Bremerhaven (Old Lighthouse). correspond to the various water levels in and around Bremen.